The global 3D sensor market was valued $1997.14 million in the year 2017 and is anticipated to grow with a CAGR of 26.54% from the year 2018 to 2023. 3D sensor market is segmented by technology in which MEMS is having the highest market share and followed by image sensors which are valued $1628.57 and $1104.76 million in the year 2017 and is expected to grow with a CAGR of 5% and 33% during 2018 to 2023. APAC region is having the highest market share of $287.35 million in the year 2017 and is expected to grow with a CAGR of 55% during 2018 to 2023. What is a 3D sensor? Three dimensional sensors are depth sensing devices which aims at connecting the devices with the real world by using projected light and a camera system. 3D sensors have a wide application in modern life. This ranges from cameras to drones and robots. These sensors transmit data with a high speed, consume less power and are portable. The technology used in 3D sensors is stereo vision, structured light, time of flight and ultrasound. The different types of products include image sensor, pressure sensor, temperature sensor and proximity sensor. This report incorporates an in-depth assessment of 3D sensor market by consumer electronics type, key technology type, by end user verticals and geography. What are the major applications of 3D sensor? The various end users assessed includes automotive, healthcare, consumer electronics, robotics and defense and among others. In consumer electronics, 3D sensors are widely used in television, smart phones and laptops. All the smartphone manufacturers are trying to incorporate 3D sensing technology in gaming, face recognition and so on. The 3D sensors are employed in healthcare industry to view the inner layers of skin, tumor and veins. 3D sensors are widely used in automotive industry to get an indication of danger, traffic in order to avoid accidents. 3D sensors are also incorporated in wearable devices along with the use of nanotechnology. The applications of 3D sensors will keep growing as there are novel inventions in electronics, automotive and other industries. Companies are focusing on manufacturing 3D imaging sensors which can penetrate through walls. This feature would aid the cable companies, broadband and smart home sectors. This feature will enhance the security in our homes and can help in monitoring the activities of many people in a room. The feature requires little work in installation and is affordable as it does not require multiple sensors. 3D sensor technology has proven to be useful in the automotive sector as it can be used by long distance drivers to monitor their own behavior. This device can be placed inside the trucks interior which detects the driver’s motion and warns if they seem to be sleeping while driving. Companies are implementing 3D sensors for Gesture recognition in user interface. This technology can be used to control games or entertainment devices by mere gestures. In order to meet the needs of our gesture and 3D sensing customers, manufacturers are integrating this technology with other optical elements, electronic drivers, and control logic which can be customized to meet the specific applications. The recent development in smartphone technology is involving the use of Simultaneous Localization, Mapping and Augmented Reality. This technology will be of great use as it will help the medical personnel to reconstruct 3D body sections quickly, by directing the smartphone to the area of interest and view the minute details which are invisible otherwise. This approach will allow the doctors to view the inner body segments such as tumors, veins and different ulcers. 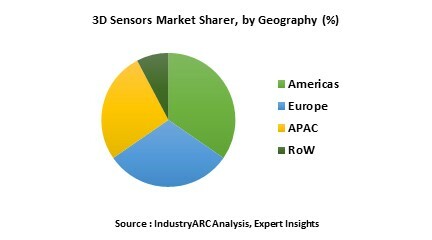 Who are the Major Players in 3D Sensor Market? The companies referred in the market research report includes PMD technologies, Microchip Technologies, Movea SA, Omnivision, Pointgrab, Qualcomm Inc., Reactrix, Samsung Electronics, Softkinetic, Sony Corp, Texas Instrument, Cognivue Corp and many others.